Final field preparation is taking place at the new Ripken Experience in Pigeon Forge, TN. The Ripken Experience is a state-of-the-art baseball fields for tournament play. According to General Manger David Bounds, “The ballparks offer young ballplayers with the ‘Big League’ experience.” The complex has six lighted fields with synthetic turf fields that are fashioned after some of the best known and iconic ballparks from around the United States – Oriole Park at Camden Yards, Isotopes and Engel Stadium to name a few. GM Bounds also stated that “We chose Pigeon Forge a number of reasons. In addition to the beautiful landscape and all that the city has to offer, we saw an opportunity to expand our reach and provide young ballplayers with a central location to compete at a high level and take their game to new heights”. An additional feature is that the fields look out over the Great Smoky Mountains. 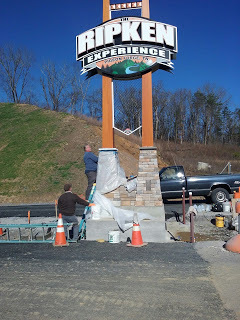 The Ripken Experience has partnered with a number of local companies to help build the complex including Merit Construction, Barge Waggoner Sumner & Cannon and Bush Builders, shown working on the sign construction. The complex is set to open in March of 2016 and they have kicked off registration for their Cabin Fever Tournament. Information for that can be found at www.ripkenbaseball.com. For information on activities, theaters, shopping, dining, lodging and outdoor attractions in the Great Smoky Mountains, go to www.brgstage.wpengine.com where you can also get maps and coupons for area businesses and attractions.